Homepage. This page: A handy leaflet given out by an Esso-approved Austin garage in Southampton. "A Good Start For Cold Weather Driving". The leaflet shown here, seemingly produced by Esso and distributed by one of it's authorised garages/retailers, gives some handy tips on how to prepare for winter motoring, before the arrival of snowy and icy conditions. The cover shows a red motorcar sweeping down the snow-covered road, while a frazzled looking chap swings unsuccessfully on his car's starting handle. His long suffering wife is seen heading towards him, a watering can of boiling water in her hand. No doubt she wasn't too impressed! 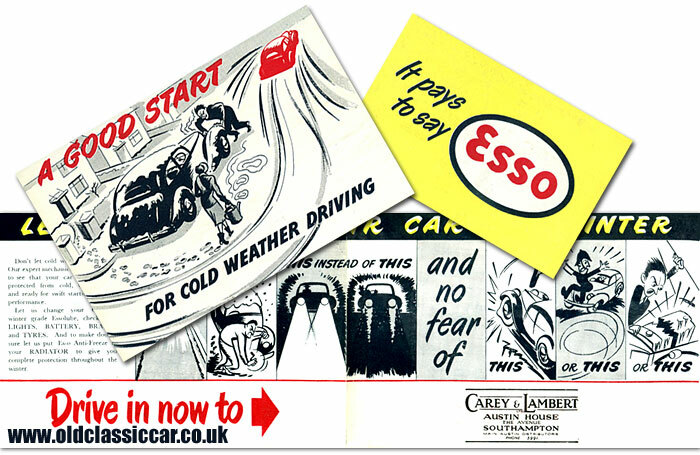 Inside are some cartoons showing the benefits to be had by preparing your automobile for wintry conditions. The first two drawings compare a car driving smoothly down the road, with the het-up looking gentleman still cranking away with his car's starting handle, the frozen engine refusing to fire into life. The accompanying text gives advice on how to avoid such kerbside embarassments, for instance "Let us change your oil to winter grade Essolube", presumably to help with an early morning start-up. Winters in the UK were generally a lot harsher then than they are today. Nowadays many people break out into a sweat if they see so much as a frozen drip on their windscreen. In the 40s and 50s it was highly prudent for motorists not to set out at all, unless they had a blanket, spade, warming flask of Ovaltine, sturdy boots and a selection of cosy clothing on board. This still applies to drivers in remoter areas of the country even now, but back then most towns and cities would often suffer really bad winters too. Many motorists would also keep a set of snow chains stashed away in the car's boot just in case, and may even have a spare set of wheels shod in grippier tyres (possibly Town and Country style, or with studs even) should the weather really close in. The remaining drawings highlight the importance of decent headlights, and that proper preparation of your car can help avoid punctures, spinning down the road and annoying constables of the law, and cracking your engine block due to not filling it with Esso Anti-Freeze. This particular leaflet was given out by Carey & Lambert Ltd, Austin House, The Avenue, Southampton, who were it seems the main Austin Distributors in that area. Some tips on preparing for winter driving in a classic car, or parking up your cherished machine for the winter months, can be found here. Another leaflet issued by this Austin garage, describing the advantages of Carey & Lambert looking after your car, can be found here. A different leaflet issued by this Esso-appointed service station can also be seen on this page.